The following example illustrates the analysis of an accelerated life test for Class B electrical motor insulation. The data are provided by Nelson (1990, p. 243). Forty insulation specimens were tested at four temperatures: , , , and C. The purpose of the test is to estimate the median life of the insulation at the design operating temperature of C.
The following SAS program creates the data listed in Figure 12.8. Ten specimens of the insulation were tested at each test temperature. The variable Time provides a specimen time to failure or a censoring time, in hours. The variable Censor is equal to 1 if the value of the variable Time is a right-censoring time and is equal to 0 if the value is a failure time. Some censor times and failure times are identical at some of the temperatures. Rather than repeating identical observations in the input data set, the variable Count provides the number of specimens with identical times and temperatures. The variable Temp provides the test temperature in degrees centigrade. The variable Cntrl is a control variable specifying that percentiles are to be computed only for the first value of Temp ( C). The value of Temp in the first observation ( C) does not correspond to a test temperature. The missing values in the first observation cause the observation to be excluded from the model fit, and the value of 1 for the variable Cntrl causes percentiles corresponding to a temperature of C to be computed. is 1000 times the reciprocal absolute temperature. The lognormal (base ) distribution is also available. The PROC RELIABILITY statement invokes the procedure and specifies CLASSB as the input data set. The DISTRIBUTION statement specifies that the lognormal (base 10) distribution is to be used for maximum likelihood parameter estimation and probability plotting. The FREQ statement specifies that the variable Count is to be used as a frequency variable; that is, if Count= , then there are specimens with the time and temperature specified in the observation. The MODEL statement fits a linear regression equation for the distribution location parameter as a function of independent variables. In this case, the MODEL statement also transforms the independent variable through the Arrhenius relationship. The dependent variable is specified as Time. A value of 1 for the variable Censor indicates that the corresponding value of Time is a right-censored observation; otherwise, the value is a failure time. The temperature variable Temp is specified as the independent variable in the model. The MODEL statement option RELATION=ARR specifies the Arrhenius relationship. The option OBSTATS requests observation-wise statistics. The options in parentheses following OBSTATS indicate which statistics are to be computed. In this case, QUANTILE=.1 .5 .9 specifies that quantiles of the fitted distribution are to be computed for the value of the variable Temp at each observation. The CONTROL= option requests quantiles only for those observations in which the variable Cntrl has a value of 1. This eliminates unnecessary quantiles in the OBSTATS table since, in this case, only the quantiles at the design temperature of C are of interest. The RPLOT, or RELATIONPLOT, statement displays a plot of the lifetime data and the fitted model. The dependent variable Time, the independent variable Temp, and the censoring indicator Censor are the same as in the MODEL statement. The option FIT=MODEL specifies that the model fitted with the preceding MODEL statement is to be used for probability plotting and in the relation plot. The option RELATION=ARR specifies an Arrhenius scale for the horizontal axis of the relation plot. The PPLOT option specifies that a probability plot is to be displayed alongside the relation plot. The type of probability plot is determined by the distribution named in the DISTRIBUTION statement, in this case, a lognormal (base 10) distribution. Weibull, extreme value, lognormal (base ), normal, loglogistic, and logistic distributions are also available. The NOCONF option suppresses the default percentile confidence bands on the probability plot. The PLOTDATA option specifies that the failure times are to be plotted on the relation plot. The PLOTFIT option specifies that the 10th, 50th, and 90th percentiles of the fitted relationship are to be plotted on the relation plot. The options LUPPER and SLOWER specify an upper limit on the life axis scale and a lower limit on the stress (temperature) axis scale in the plots. The plots produced by the preceding statements are shown in Figure 12.9. The plot on the left is an overlaid lognormal probability plot of the data and the fitted model. The plot on the right is a relation plot showing the data and the fitted relation. The fitted straight lines are percentiles of the fitted distribution at each temperature. An Arrhenius relation fitted to the data, plotted on an Arrhenius plot, yields straight percentile lines. Since all the data at C are right censored, there are no failures corresponding to C on the probability plot. However, the fitted distribution at C is plotted on the probability plot. The tabular output requested with the MODEL statement is shown in Figure 12.10. The "Model Information" table provides general information about the data and model. 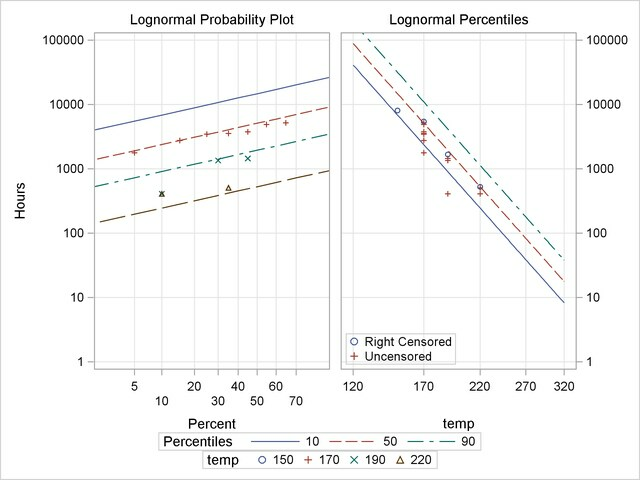 The "Summary of Fit" table shows the number of observations used, the number of failures and of censored values (accounting for the frequency count), and the maximum log likelihood for the fitted model. The "Lognormal Parameter Estimates" table contains the Arrhenius-lognormal model parameter estimates, their standard errors, and confidence interval estimates. In this table, INTERCEPT is the maximum likelihood estimate of , TEMP is the estimate of , and Scale is the estimate of the lognormal scale parameter, . The "Observation Statistics" table provides the estimates of the fitted distribution quantiles, their standard errors, and the confidence limits. These are given only for the value of C, as specified with the CONTROL= option in the MODEL statement. The predicted median life at C corresponds to a quantile of 0.5, and it is approximately 47,134 hours. In addition to the MODEL statement output in Figure 12.10, the RELIABILITY procedure produces tabular output for each temperature that is identical to the output produced with the PROBPLOT statement. This output is not shown.